You’ve likely learned by now that you can rotate single bonds (“sigma bonds”) but you can’t rotate multiple bonds (Pi bonds). Now we can start talking about some of the consequences of this. The different 3-D shapes a molecule can turn itself into through rotation are called conformational isomers. They’re the same molecule, but in different shapes. Remember that opposite charges attract, like charges repel? Here’s two “conformations” of ethane, C2H6. In the “conformation” on the left, the bonds on the adjacent carbon atoms are closer together than they are in the “conformation” on the right. Electrons don’t like each other’s company! (like charges repel). Since the bonds in the conformation on the right are farther apart, it is also more stable. What this means is that the molecule on the left feels strain, which can be relieved through rotation of the C-C bond by 60 degrees. 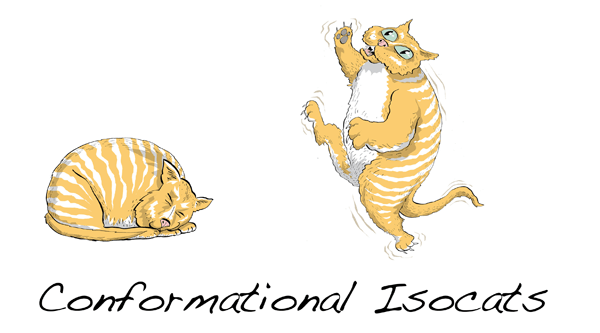 (a common term for this is “torsional strain”. )Like when you take a spring, and you twist it – there is a tension that arises there – it wants to twist back to its original state. The difference here is small (about 10 kJ/mol) but as the adjacent groups get bigger, so does the difference in “comfort”. PS. 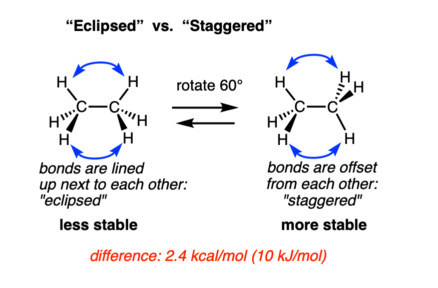 The molecule on the left is said to be “eclipsed” while the one on the right is said to be “staggered”.